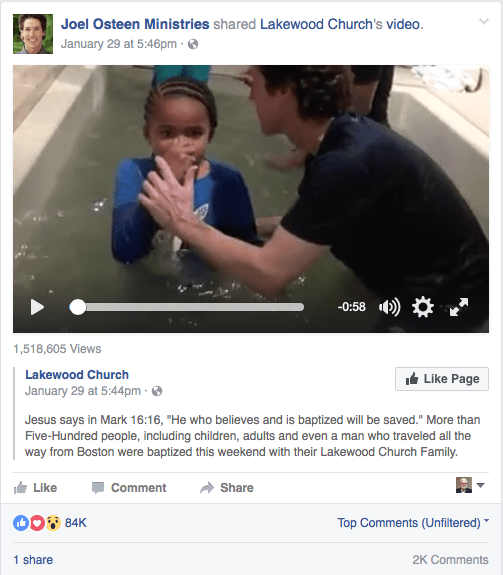 “Five hundred people, including children, adults and even a man who traveled all the way from Boston were baptized this weekend with their Lakewood Church Family.” That’s the description on the Facebook post by Lakewood Church. Baptized by a charlatan. Yeah. The baptismal event orchestrated by Lakewood and – for at least those in the video clip – administered by Osteen himself, was lacking in a couple of things that most evangelicals will find common to the typical church’s practice. The baptismal candidates, prior to their immersion, were not asked any prefatory, qualifying questions. There was no inquiry about the spiritual validity of their pursuit of baptism. No “Have you been saved?” or “Have you confessed Jesus as Lord and Savior?” There wasn’t even the Scripturally-offensive query of “Have you asked Jesus into your heart?” Even this abysmally minimal standard that is typical of most evangelical churches was ignored by Osteen. While it’s possible these queries could have been reviewed prior to the actual baptism, the event was also lacking the typical pastoral pronouncement over the baptismal candidate: “I baptize you in the name of the Father, the Son, and the Holy Spirit,” sometimes with the addition of “buried with Him in death, and raised with Him to newness of life.” Joel skipped this. Of course. But, since Osteen isn’t actually a “Gospel” preacher proclaiming the actual “Gospel” of Scripture, none of those being baptized in accordance with the “gospel according to Osteen” were doing much more than assuaging themselves in Lakewood’s (rather dirty-looking) baptistry waters for the gratuitous satisfaction of man-made legalism and emotionalism. Apart from authentic regeneration, which does not happen apart from the authentic Gospel, these souls were just part of a show … and a somewhat viral Facebook video. While the Biblically-astute rightly view it with intentionally discerning critique, one thing the baptism video did garner was attention. Mostly positive attention. At the time of this writing, it had over 1.5 million views and over 84,000 responses. The responses were overwhelmingly positive – nearly 72,000 “thumbs up” and over 12,000 “heart” emoticons. It also drew over 2,000 comments, which in themselves reflect the woeful state of Biblical literacy of the commentators … but, then, they are following Joel Osteen. You don’t get much “Bible” from following a charlatan, but, with Osteen, you do get a free, nifty mantra. This is my Bible. I am what it says I am. I have what it says I have. I can do what it says I can do. Today I will be taught the word of God. I boldly confess my mind is alert, my heart is receptive; Ill never be the same. In Jesus name, God bless you. “I baptize myself everyday when I take a bath…Its between me & Jesus..I accepted the Lord..My father God & The Holy Spirit at age 4…I dont need a human to baptize me…The Lord stands alongside me everyday as I pray in the bath tub and dunk myself..Thats my way daily of my worship to my Savior. In his recommended book on childhood conversion and baptism, Do Not Hinder Them, Justin Peters gives a needed warning to legitimate churches (Lakewood, again, would NOT be counted among them, to be sure) about the intentional need for caution.